If you want to enjoy the wildlife of lush evergreen rain forest and dry deciduous and marine forest in the same tour, this is an ideal option for you. You will explore more species of wetland flora and fauna in Sinharaja which is listed as one of the eight UNESCO world heritage sites in Sri Lanka and get the opportunity to experience a dry zone national park in Yala which has the highest density of leopards in the world. In this wildlife tour, you will be accommodated in the Rainforest Eco Lodge and the Leopard Nest. The Rainforest Ecolodge, Deniyaya has been designed to preserve and provide a sensational experience of the forest habitat in all its glory. The symbiotically blended forest environs to comfort and privacy tendering the best possible commune with nature. Environmentally-friendly alfresco room, observation deck, lounge, and meeting room form key components within each unit. Guests can also enjoy the spellbinding view from any part of the lodge. The colourful, breathtaking opera of endangered ‘local culture’ can now play every day to the concert perch of the open viewing deck. Feel at home within 16 comfortable chalets that are designed with recycled material and adorned with every amenity imaginable. The chalets are situated among the tea patch and offer guests breathtaking views of the forest canopy and tea estate that provide for lasting memories. Experience the vibrant shades of nature all at once. The interior is ideally decorated with bamboo paneling while the floor and private deck done with rejected railway sleepers. It’s a fitting introspection to dazzling biodiversity. 08:00: You will be picked up from your hotel and driven approximately four hours to reach Sinharaja. 12:00: Arrive at Rainforest Eco Lodge in time for lunch. After Lunch, check in to the hotel and spend a couple of hours at leisure enjoying the surrounding of the hotel. 15:00: Your guide will take you on a memorable nature trail in Sinharaja that can be described as a Tropical Lowland Rainforest or Tropical Wet Evergreen Forest. Whatever its 'technical' name, it is undoubtedly a rich treasure trove of nature with a great diversity of habitats and a vast repository of Sri Lanka's endemic species found nowhere else in the world. 17:30: Arrive back at your hotel with wonderful photographs and spend rest of the day at leisure. Enjoy your dinner and spend the overnight at Rainforest Eco Lodge. 05:00: You will get your wakeup call that gives you the message to get ready for the morning trekking tour that will start at 5:30 a.m. This early morning trails will provide maximum opportunity to witness the beauty of the rainforest. 07:30: You will arrive at your hotel in time for breakfast. After breakfast, you will check out from your hotel and proceed to Yala. 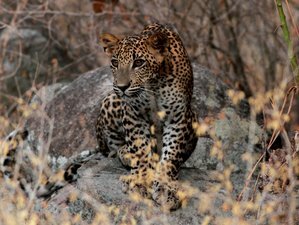 12:30: Upon arrival at Tissamarama, you will be collected by the Leopard Nest jeep and driven to Leopard Nest. 13:00: Arrive at the Leopard Nest campsite and check in to one of the nests in the campsite followed by a short introduction by the camp manager on everything you need to know about the campsite. 13:00 - 14:30: Enjoy Lunch at the main restaurant in the campsite or at one of many outdoor locations available in the campsite. After lunch you can relax and unwind by taking a nap in the hammock or checking books about wildlife in the library. 15:00: You will start your evening game drive at Yala National park to experience the wildlife treasure in one of the best homes for Leopards and other animals in Asia. 18:30: Arrive at the campsite and enjoy your private alfresco shower followed by drinks and appetizers around the campfire. Stay overnight at Leopard Nest. Wake up at dawn around 5:00 a.m. to freshly brewed ceylon tea or coffee. Then leave on morning game drive at 5:30 a.m. Return from morning game drive at 9 to 10 a.m. to freshly squeezed juices from seasonal fruits followed by breakfast. You will check out at 11:00 a.m. and be transferred back to your hotel. Sinharaja Rainforest is a world heritage site and major ecotourism destination, which can also be described as a Tropical Lowland Rainforest or Tropical Wet Evergreen Forest which covers an extent of approximately 11187 hectares. Whatever its ‘technical’ name, it is undoubtedly a rich treasure trove of nature with a great diversity of habitats and a vast repository of Sri Lanka’s endemic species found nowhere else in the world. Bird watching in this ecosystem is particularly interesting because it is home to 95% of the endemic birds of Sri Lanka, named as a world heritage site in 1989. This lowland evergreen rain forest is steeped in deep legend and mystery. The word ‘Sinharaja’ means, Lion (Sinha) King (Raja), and it is popular belief that the legendary origin of the Sinhala people is the union between a princess and the lion king who once lived in the forest. You will be privileged to learn of geology, plant lives and animal lives during the trekking with a naturalist.